Bob Wetta to serve on President Trump's Advisory Council on Doing Business in Africa. On April 26, 2018, Secretary Wilbur Ross, United States Department of Commerce, appointed Bob Wetta, President and CEO of DSC Dredge LLC to serve on the President’s Advisory Council on Doing Business in Africa (PAC-DBIA). Bob Wetta named Charlie Sinunu, DSC’s Director of International Dredge Sales to his staff and they will help identify commercial opportunities for the United States in the region. Bob Wetta shared, “Being tapped to serve on the Council is an honor and a privilege. If the United States implements trade sanctions including tariffs then all outcomes of the China-U.S. trade talks will be void, state news agency Xinhua said on Sunday following high-level trade discussions in Beijing.China is willing to increase imports from multiple countries including the United States, Xinhua said, adding that reform and opening up and increasing domestic demand were China's national strategy.The statement was released following the conclusion of talks between U.S. Commerce Secretary Wilbur Ross and Chinese Vice Premier Liu He. U.S. Commerce Secretary Wilbur Ross said on Wednesday he expects trade actions between the United States and China will likely lead to a negotiated deal, but that it was unclear whether such talks would happen by the end of May or later. "It wouldn't be surprising at all if the net outcome of all this is some sort of a negotiation," Ross said in an interview with CNBC. Ross' comments come after China slapped retaliatory duties on a number of American products earlier on Wednesday in response to Trump's planned tariffs on Chinese goods, rattling global financial markets. The United States has set conditions for scrapping its planned punitive tariffs on steel and aluminum imports from Europe, German magazine Der Spiegel reported, including capping U.S.-bound exports of the metals at 2017 levels. The European Union has been pushing for talks to avert a trade war since U.S. President Donald Trump announced he would slap tariffs on a raft of high-value European exports in retaliation for alleged steel and aluminium dumping. The conditions named by U.S.
U.S.-China economic talks appeared off to a contentious start on Wednesday as senior Trump administration officials demanded a "more fair" China trade relationship while both sides canceled news conferences previously planned to discuss outcomes. U.S. Commerce Secretary Wilbur Ross in opening remarks to the annual summer dialogue between Washington and Beijing criticized China's $347 billion trade surplus with the United States. 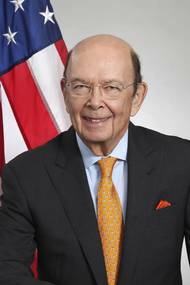 "We must create more balance in our trade by increasing exports of made-in-America goods to China," Ross said at the Treasury Department. U.S. Trade Representative Robert Lighthizer said on Wednesday there was no deadline for completing NAFTA trade talks between the United States, Canada and Mexico even as lawmakers warned that U.S. business would be hurt by prolonged negotiations. "There is no deadline. My hope is that we can get it done by the end of the year, but there are a lot of people who think that is completely unrealistic," Lighthizer told a Senate Finance Committee hearing to discuss the USTR's budget. Under U.S. law, Lighthizer, a veteran trade lawyer, will be the principal U.S. negotiator on NAFTA, although U.S.
U.S. President-elect Donald Trump on Tuesday named Robert Lighthizer, an official in the Reagan administration and harsh critic of China's trade practices, to be his chief trade negotiator, responsible for better deals aimed at reducing U.S. trade deficits. Trump, who promised during his presidential campaign to renegotiate international trade deals like NAFTA and punish companies that ship work overseas, said in announcing his choice that Lighthizer would help "fight for good trade deals that put the American worker first. "Lighthizer is a former deputy U.S.